Bombur goes for a ride. The second Barrel Rider statue from Weta. Based on The Hobbit: The Desolation of Smaug. Sculpted by artist Steven Saunders, who worked on the movie! That looks like a barrel of fun! 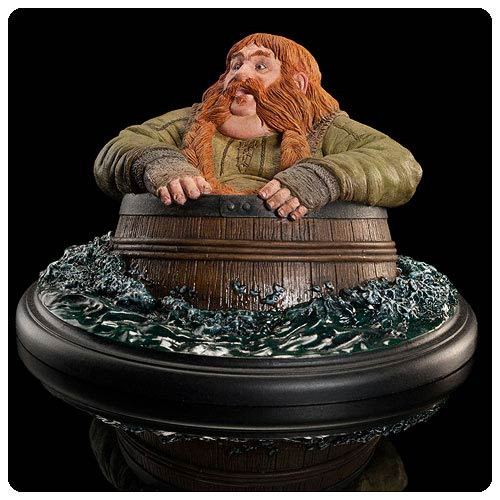 The second in a suite of Barrel Rider statues from Weta, The Hobbit The Desolation of Smaug Bombur the Dwarf Barrel Rider Statue measures 4 1/10-inches wide x 4 1/10-inches long x 2 7/10-inches tall and features the rotund dwarf barreling along with the current with an excited expression on his face. Each polystone statue is painted by hand and features a sculpt by artist Steven Saunders, who worked on The Hobbit: The Desolation of Smaug, so you know you're getting a terrific statue! Open edition.